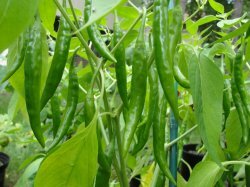 This is the most popular hot pepper grown and used in various spicy foods in India. Also known as the Reshampatti chili pepper, it is a broad and short chilli with quite thick skin, the colour is dark maroon, medium hot and not great for adding colour. It�s used for making stuffed pickle. This can also be used to substitute Thai Chilli Pepper.This variety is also often called Finger Hot Indian Pepper. The umbrella type plant produces lots of fruits in green colour in early stage and later turning into red ripe. The matured hot pepper has high pungency, excellent to use fresh or dried. The fruit with wrinkled skin is about 4" in length. This variety has wide adaptability and is easy to grow in containers.